Research on Women – Why Isn’t There More? Since I got behind on writing this week (I had to set up for a 3 hour webinar yesterday), I’m running an excerpt from the forthcoming women’s book (which is coming along I promise) about research on women and why there isn’t more of it. It’s probably subtly different from what is actually in the book since I did a lot of rewriting but hopefully gets the concepts across. There’s exactly nothing practical here, it’s just kind of some interesting (I hope) blather to introduce the topic. For a number of reasons, a great deal of early research (with the possible exception of diet research) was done on males. This was especially true in the athletic realm and especially in the early days of sports science research. It wasn’t until about the 80’s when a great deal of the gender specific or comparative research really started to be done (1). But as more and more research started to develop that either repeated the same studies in women or compared men and women, it became rapidly clear that there were differences, some of which were subtle and some of which were distinctly not so subtle. A singular example will hopefully make the point. Endurance athletes such as runners or cyclists will often use a dietary strategy referred to as carbohydrate loading where they combine intense exercise with a drastically increased amount of carbohydrate in their diet. The goal of this is to increase the store of carbohydrate in the body (muscle and liver) to improve performance. And early studies showed that this worked well for men. They increased the storage of carbohydrate in their bodies and performance improved. But in women it didn’t seem to have the same effect. In one comparative study, while men increased their muscle carbohydrate stores when fed a 70% carbohydrate diet, women did not. For fairly logical reasons, biological differences were assumed to be the case since, as often as not, it does explain the differences that are seen. But this was actually wrong. Rather, the lack of women to respond to carbohydrate loading turned out simply to be a consequence of female athletes being smaller than men. Because women are generally smaller, they have a lower energy expenditure and lower food and calorie intake. Due to that, the same 70% carbohydrate provided less total carbohydrate in terms of the number of grams. And what was actually going on was that the women weren’t consuming enough total carbohydrate to successfully carb-load. So imagine a woman with a daily energy expenditure of 2000 calories and a male with a daily energy expenditure of 3000 calories. At 70% total calories the female is eating 350 total grams of carbohydrate and the male is eating 560 grams. The percentage is the same but the total amounts are drastically different. When women were fed about 30% more carbohydrate to match the total grams of carbs, women did carb-load better although still not to the same degree. Finally, when women were fed enough total carbohydrate (10-12 g/kg), they did carb-load just like men. It was simply an issue of amounts. But that brought up another problem, the women’s diet became more or less impossible to follow in a practical sense. Either the amount of carbohydrate crowded out the other nutrients (protein and fat) or required them to eat too many calories total. Their smaller size and energy expenditure basically made it impossible to achieve what men could without eating too much food. The effect is compounded by the fact that many female athletes are restricting their food intake for either appearance or performance reasons. 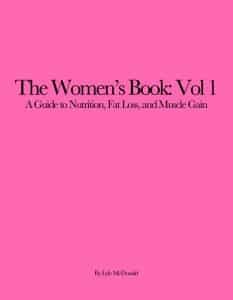 Female athletes who need to lose fat may not be able to consume enough calories or carbohydrate to optimally sustain their training or performance although I will provide a solution to this problem later in the book. For female dieters, often the total amount of calories that can be eaten is so low that making changes to the diet becomes very difficult. There are other issues that come up here, strategies that men (who have more calories to work with) can use that smaller female dieters simply cannot. This topic, some of the differences between what women and men can and cannot do with their diet, is something that I’ll bring up repeatedly throughout this book. This points to the need for nutritional periodization among women, different diets for different goals (and an adjustment to training). A female endurance athlete might reduce body fat during her preparation phase when there’s more low-intensity volume being done (needing less carbohydrate) so that she can focus on optimal nutrient intake during her competitive season. Physique athletes have long alternated between gaining phases (slight surplus) and dieting phases (deficit) and this works better for most. But the practical effect of this is that a woman’s approach to diet and nutrition, whether for performance or fat loss, may differ from that of a man. And it wasn’t until 2013 that the idea of women’s specific nutrition was really addressed in any comprehensive way (2). Think about that, not until the early 2010’s has this become an issue that people are really writing about. So why did research focus on males, especially in the athletic realm? Some of it probably represented nothing more than pure chauvinism: most researchers were male and in many areas of science, researchers tend to study what they knew or cared about. If nothing else, male researchers typically bring a very male approach to the topic. You see this in other fields such as anthropology where male and female scientists draw different conclusions due to observing things from their personal perspective. But at least part of the reason men were typically studied was that it’s only been a fairly recent development that women started to enter sports in any large amount. For the first half of the 20th century, it was generally assumed that women were incapable (or would suffer actual physical damage) of performing high-level sports. This idea still persists and you will hear people talk about how heavy weight lifting will make a women infertile or what not. 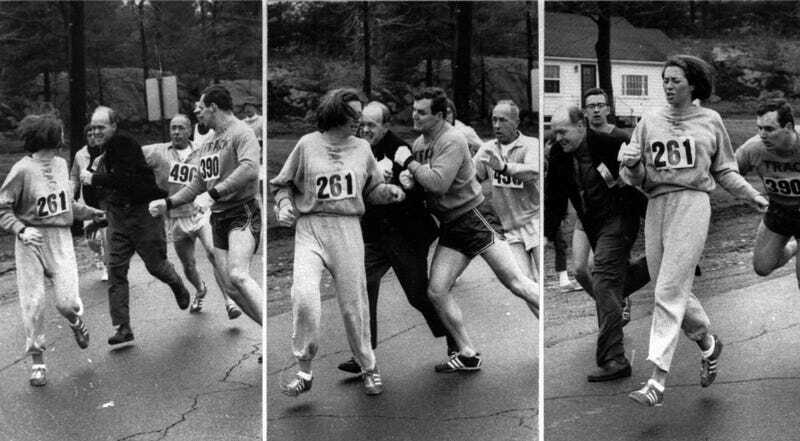 At the extreme, women were actually barred from entering certain types of events such as the marathon (this was in 1967). There is actually a picture online of a female runner being chased down the course by males trying to get her to stop competing. In the US, the passing of Title IX in the 70’s (which required similar amounts of female sports accessibility) caused a major change in this with more and more women entering sports at various levels due to not only better access but also changing societal attitudes towards the topic. In other countries, at least in sports that had the potential for women to win World Championships or Olympic medals since that is a major part of global competition, the countries typically didn’t care. They wanted medals and were happy to throw women into them. The German female track and swimming team was dominant in the 80’s and the Chinese female athletes in many sports have been completely dominant on the world stage. In other countries, many of the same social factors still exist (i.e. Kenyan women don’t dominate distance running since it’s not socially acceptable for them to run like the men). In any case, the general lack of women in sport up until fairly recently is a big part of what caused research to be performed primarily on men. There were more men to study and their performance was more of a priority. And it was simply assumed that research would would apply to women. And as I showed above with the carb-loading study, clearly this assumption was incorrect in many cases. And it’s turning out to be the case for a lot more things than just that. Even when research was done on females, or at least included both women and men in the studies, it was often very poorly done in the early days of research. Despite knowing about a woman’s menstrual cycle for decades, male researchers either didn’t know or didn’t bother to take it into account. Without any sort of standardization as to where a woman was in her cycle, the results were suspect at best and useless at worst. The basic problem comes down to what I mentioned in the preface. Men show basically a static hormonal state on a day-to-day, week-to-week and month-to-month basis. There are gradual changes with aging but that’s not really important over the short durations that most studies are done over (to study this, researchers study old men or compare young to old men). But this is completely untrue for a woman (except under some very specific situations). This is due to the existence of her menstrual cycle, discussed in Chapter 3. But simply, the “normal” menstrual cycle is the roughly 28-day cycle stretching from the start of menstruation to the next. 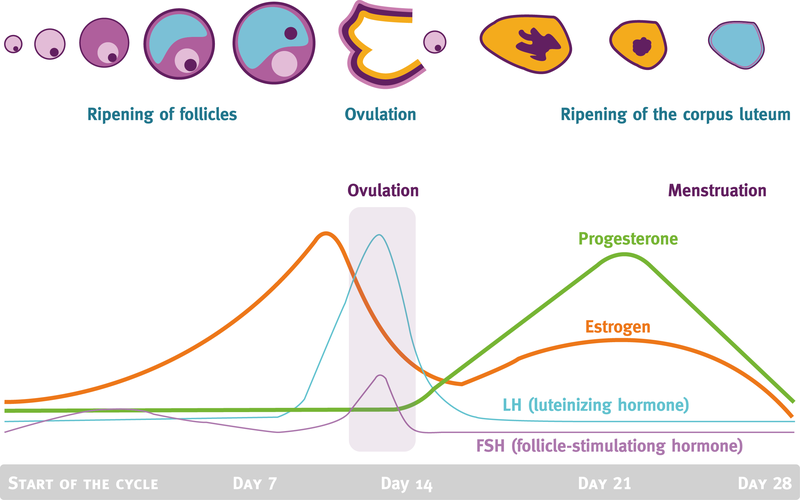 This time period is divided roughly into two phases called the follicular and luteal phases with ovulation (the release of the egg) occurring in the middle. Those phases are typically divided into sub-phases but that’s not important here. Don’t worry if these terms are Greek to you right now, the important concept here is that, in contrast to men’s static hormone levels, women’s hormones are increasing, decreasing and interacting in all sorts of complicated ways. And this changes almost all aspects of her physiology to one degree or another. And this makes studying women far more difficult than studying men since where in the cycle a woman is measured determines what may be seen (and often these differ for the follicular versus luteal phases). Adding to that, while the average menstrual cycle is about 28 days, this can vary from 24-32 days. Some women have a shorter cycle, some women have a longer cycle. Even the same woman can have a cycle that varies from month to month. Trying to standardize where a woman is in her cycle is problematic at best and damn near impossible at worst. About the only part of the cycle you know for sure is the start of menstruation when bleeding starts. Everything else can be a bit of a crapshoot. And this causes real problems. A woman may start menstruating or ovulate at a slightly different time each month; miss it and you have to wait a month to try again. I was talking with someone at the ISSN conference last year and he said that one of his female subjects started her period a day early. So they had to wait a month to get her back into the lab. So, when research is trying to compare women and men, it’s critical that the woman be measured in the same part of her cycle. Otherwise her measurements won’t be comparable to one another. As well, in some cases, women will show the same response as men during one part of their cycle but a different response in another part of their cycle. To compare phases, you have to measure a woman at different parts of her cycle. This is true of caffeine metabolism, for example, where women metabolize caffeine identically to men in the first half of the cycle but more slowly than men (while being less sensitive to it) in the second half. If you only snapshot one part of the cycle or the other, you can reach an incomplete conclusion. In an attempt to get around at least some of this, researchers often try to measure women at either the mid-follicular or mid-luteal phase (which are technically about 3-5 days long) but they still have to hit the days right to one degree or another. This is further compounded by it sometimes being difficult in the first place to tell where in her cycle she is. Crude methods will use the measurement of basal body temperature (BBT) since temperature typically goes up after ovulation but often some very complex technology is used to figure out where the study subjects are in their menstrual cycle. And this isn’t cheap. Then add to that yet another problem (inherent to research in both women and men) which is individual variability. Not only does the menstrual cycle vary in length from month to month, women often show very different response across the cycle in terms of, well, everything. Many studies only report the average response and that can mask individual variability between two women. Consider the impact of the final week of the luteal phase (typically when PMS, pre-menstrual syndrome occurs). Some woman have zero issues, most have some type of physical or psychological complaints and some women are incapacitated with depression, painful cramps and can’t get out of bed. Three women, same phase, completely different responses. If you average them, you miss the details. There are actually a number of other issues that come up when comparing women to men mostly having to do with figuring out how to even express the differences in response but I’m not going to get into detail about them. Primarily they have to do with differences in body size, relative amounts of fat and muscle and other factors that raises the issue of how the comparisons should actually be made. But that’s more detail than I want to get into here. Just accept that this gets very complicated very quickly. It’s a running joke that nobody understands women and there is much truth to this. In posting excerpts of this book online, I’ve found that many women aren’t familiar with the terminology or hormones that are involved in their own menstrual cycle. Frequently neither are their medical providers. And if women don’t know much about this topic, it’s unlikely that most men do either. Which is important when you consider the fact that many of those who coach or advise females on any aspect of training or diet are male. Because even when all of the above is taken into account in terms of standardizing and controlling when in the menstrual cycle research is done, there is an additional factor to consider. Researchers usually like to try to figure out what is actually causing an effect more than just observing that it occurs. And when you get into women’s hormones this gets very complicated. The two primary female hormones, estrogen and progesterone, show enormous changes in levels across the menstrual cycle and this makes determining what hormone is responsible for what effect can be very difficult. Is it the increase in one hormone, the decrease in another hormone, the changes in both, the interaction of the two (in some cases one hormone cancels the other one out usually progesterone having reverse or negating effects on estrogen). In some cases, it’s the ratio of the hormones. Frequently, researchers use animal models but this brings in its own set of problems, primarily the question of whether or not the animals respond the same as humans do. Frequently they do not (stress is a good example, female rats show more stress than males under most conditions but female humans often show less). Another approach is to inject men with a woman’s hormones to the level seen in one or the other phases to determine if the same effect is seen. A problem here is that hormones often act differently or in the opposite fashion in different each gender. So testosterone, the primary male hormone, may have different effects in women and vice versa. Usually what is done in humans is to first shut down a woman’s normal hormonal shifts completely. Then, one or the other, or some combination of estrogen and progesterone are introduced back into her body and measurements are taken. This provides far more control and it becomes easier for researchers to determine what is causing what exactly. And while there were endless questions as to which hormone or what hormonal interaction was causing what effect in women, in recent years, the picture has become far more clear. And that brings up one final issue I want to discuss in terms of why research on women has frequently been limited relatively speaking. And that is because, as much as the menstrual cycle itself can be extremely difficult to study, there are a multitude of other hormonal situations that are often found in women. One issue is that the menstrual cycle itself can become disrupted in a number of ways. The primary two I will discuss in this book are oligomenorrhea which is an infrequent cycle (occurring every 35-90 days) and amenorrhea, the complete loss of the menstrual cycle. There is the common use of birth control (BC) among women which not only changes a her physiology but is complicated by there being multiple types of application and combinations of hormones that are used. These tend to vary more by degree than being completely different but there are situations where one form or type of application acts very differently than others. For example, oral birth control that goes through the liver can do very different things than other modes of application such as the implant, patch or hormonal IUD which don’t. Another commonly situation is Poly-Cystic Ovary Syndrome (PCOS) which is often associated with elevated testosterone/androgen levels in women. Other women may have a subclinical hyperandrogenism, higher than the typical woman but not as high as in PCOS. And the impact of testosterone on female physiology can be profound. Women can also show significant changes in physiology across their lifespan. I won’t discuss it to a great degree in this book but a huge number of changes occur at puberty, when a woman’s reproductive system start operating and the menstrual cycle starts. I mentioned the normal cycle (often modified itself) that occurs during a large part of her adult life and then there are the changes that occur called peri-menopause (which has an early- and late-phase) and at menopause itself when a woman’s reproductive system shuts down. A huge number of changes occur here but even that can be modified by whether or not she chooses to go on Hormone Replacement Therapy (HRT). There is even a specific type of HRT for women who have had a partial hysterectomy. And all of these situations are slightly or not so slightly different in terms of a woman’s underlying physiology. Each has to be studied either in isolation or, as frequently as not, to compare the changes that occur. So researchers may study males, normally cycling females and females who have lost their cycle to compare and contrast the changes. Or they may study the normally cycling female to women on BC to see how birth control is changing (or not) the typical menstrual cycle response . And that comes back to the various types and forms of BC which may all vary slightly where you have to test multiple types in case they work differently. I think you get the idea. Once again contrast this to men who have a basically flat hormonal profile outside of some changes that occur with aging or in certain disease states. And to one degree or another, in terms of research on the topic, it’s usually just easier to study men. And the simple fact is that, while a tremendous amount of gender based research has started to appear, a grand majority of it, especially in the realm of sports science has been done on men. Before wrapping up this chapter, I want to mention one somewhat amusing exception where the above is actually reversed; that is where there is far more research on women than men and where that female oriented research may have been inappropriately applied to men. And that exception is in the realm of diet and weight loss studies. A reality is that at any given time women are far more likely to be dieting than men and found in diet programs. For example, there is a database of successful weight losers called the National Weight Control Registry (NWCR) and it is composed of roughly 80% women. The reality is that a great many weight loss approaches, studies, etc. are either done exclusively or predominantly on women and there has been some recent question whether or not this information applies equally to men. Dieting, diet groups, etc. are often seen as a “woman’s domain” and men may be less likely to pursue either for a variety of reasons. Researchers have been working on more “male oriented” weight loss programs including male humor (which I take as fart and poop jokes) and sporting team affiliation (3). 1. “Gender Differences in Metabolism.” Edited by Mark Tarnopolsky. (1999) CRC Press: Boca Raton, FL. 2. “Nutrition and the Female Athletes: From Research to Practice.” Edited by Katherine Beals. (2013) CRC Press: Boca Raton Florida. 3. Robertson C et. al. Should weight loss and maintenance programmes be designed differently for men? A systematic review of long-term randomised controlled trials presenting data for men and women: The ROMEO project. Obes Res Clin Pract. 2015 Apr 30.